A replacement tub from of Florida Energy Water & Air is the ideal solution to a bathtub that is old, out of date, and showing the battle scars of many years of wear and tear. We offer professional bathtub replacement services throughout Central Florida, including Orlando, Tampa, St. Petersburg, Lakeland and Melbourne. Our replacement tub products are made by Luxury Bath Systems, a company that specializes in producing conventional tubs, walk in tubs, shower pans, accessories, and more, all of which are attractive, durable, and low maintenance. While it is true that you can buy a replacement tub just about anywhere, with Florida Energy Water & Air, you will benefit from working with one of Florida’s most well respected home improvement companies. Since our founding in 1989, we have worked diligently to develop a reputation as a company that provides top-quality products and superior customer service. Unlike many of our competitors, we do not use subcontractors. Every individual who participates in your bathtub replacement project will be a full-time employee of Florida Energy Water & Air. All of our tubs also come backed by a one-year service warranty, with the option of purchasing a longer warranty available. 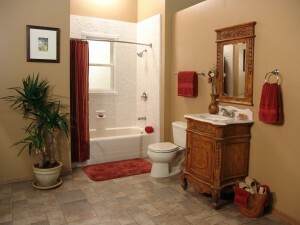 To get a price on a replacement tub from Florida Energy Water & Air, contact us today. We offer next-day installation in Orlando, Tampa, St. Petersburg, Sarasota, and other nearby areas of Central Florida. We also sell and install bathtub and shower liners, walk in bathtub systems, home air conditioners, solar water heaters, and a variety of products made by RainSoft, such as water softener systems, drinking water filtration systems, air purifier units, and more.